Home »Posts Tagged "Middle East"
Color has long be used to implicitly or explicitly transmit and communicate ideas or messages. But do we all receive the same signals regardless of our origin and beliefs ? 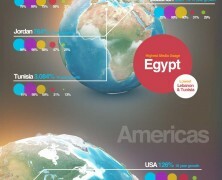 This chart puts color on the map and presents color perception among various cultures and religions. Produced by the expert team at Cegid UK this informative, fact packed infographic highlights the current and anticipated future condition of the global retail environment. Discover current and emerging trends, evaluate the economic landscape in every corner of the globe and uncover the huge potential in emerging markets. Predictions are of the most optimistic regarding the growth of e-Commerce in the Middle East. It is expected that by 2015 the B2C e-Commerce market will turnover $15 billion resulting in about 70% increase from 2012. Find out more insights about online shopping in MENA. Facebook outweighs other social media for business usage in Middle East and Africa.